Pick Up Sticks is a table game that the whole family can enjoy. 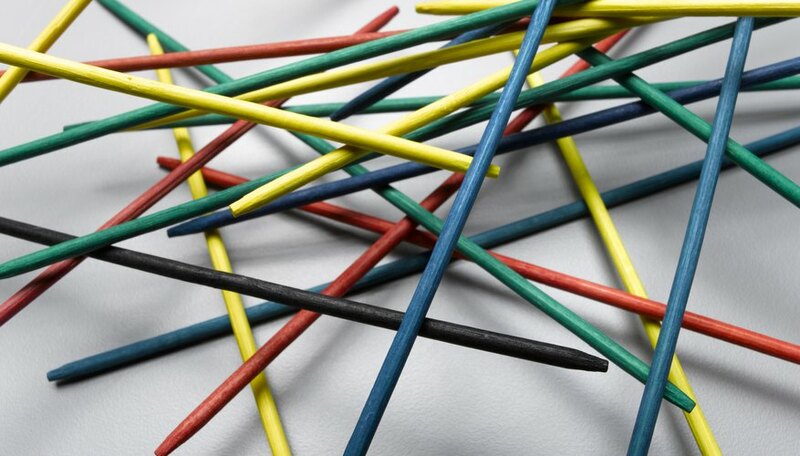 Faced with a jumbled up pile of wooden or plastic sticks, your job is to show that you have nerves of steel and a steady hand, picking up sticks one at a time without moving others in the pile. You can play the game with two or more players. Gather all the sticks together and put your hand around the middle of the bundle. Stand one end of the bundle on the table and let it go so the sticks fall randomly. The aim of the game is to try to remove individual sticks from the pile without making any other sticks move. If you get one stick out without moving others, you keep it and carry on picking up new ones until one of your moves disturbs the pile. At this point, play passes to the next player. The winner is typically the player who collects the most sticks. If your game allocates values to sticks by color or bands, the winner is the first player to reach a set score or the player with the highest score at the end of the game. Some Pick Up Sticks games come with a master stick that is a different color from the others. In some games, players simply use this as a pick-up tool instead of using their hands; sometimes it is the highest scoring stick in the game. Alternatively, it can give players who pick it up an advantage. For example, in some versions of the game the player that gets the master stick can then use it to move or separate sticks to change the layout of the pile before picking up the next stick. You don't have to use your hands or a master stick to pick up sticks -- you can put one stick aside before the game and use that, or players can use the first stick they win. To make the game more challenging, set a rule that players can't use their dominant hand, making right-handed players switch to using their left hands and vice versa. Can You Slow Down the Sensitivity on the PS3 Controller Sticks?